Kansas State (3-4, 1-3 Big 12) at No. 8 Oklahoma (6-1, 3-1), 3:30 ET (Fox). Series record: Oklahoma leads 75-19-4. Oklahoma bounced back from its loss to Texas with a rousing 52-27 win over TCU last week. The Sooners would like to put together another sound defensive effort under interim defensive coordinator Ruffin McNeill. They can’t afford to slip if they want to reach the College Football Playoff again. Kansas State is building momentum, too. The Wildcats rolled past Oklahoma State 31-12 in their last game, and then had an off week to prepare for the Sooners. Oklahoma’s defense vs. Kansas State’s running game. Kansas State has averaged 305 yards rushing its past two games. Oklahoma has struggled to get its defense off the field at times. Army had the ball for more than 44 minutes in a game the Sooners barely escaped with a win. Kansas State is fully capable of bleeding the clock and keeping Oklahoma’s high-octane offense on the sideline. KANSAS STATE: RB Alex Barnes. The junior ran for 250 yards and three touchdowns against Baylor, then 181 yards and four touchdowns to go with 51 yards receiving two weeks ago against Oklahoma State. He leads the Big 12 in rushing and ranks 13th nationally. Oklahoma: RB Kennedy Brooks. 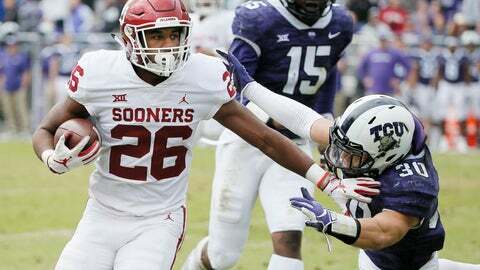 The freshman has emerged as the breakout threat the Sooners lost when Rodney Anderson suffered a season-ending knee injury. He ran for 168 yards and a touchdown last week against TCU. He averages 10.9 yards per carry. Oklahoma ranks third nationally in points per game and seventh in total offense. … Oklahoma is 12th nationally in kickoff return average. … Oklahoma QB Kyler Murray ranks second nationally in passing efficiency. … Murray is seventh in the Big 12 in rushing with 419 yards. … Kansas State held Oklahoma State more than 200 yards under its average.